Although the war in eastern Ukraine has been simmering for months, the escalation in violence is continuing as summer turns into fall. There has been a false sense of complacency in the West, that the situation on the ground has been frozen and that the danger of a major war has been mostly averted. Nothing could be further from the truth. President Vladimir Putin from Russia knows his window of opportunity is closing and that he must move forward, to achieve his objective of rewriting the post Cold War order. The Europeans have spent most of 2015 dealing with economic issues associated with debt and the lack of growth across the region. The debt crisis in Greece, has dominated the headlines across most European capitals throughout the spring and summer. The economic war between Russia and the rest of the continent has been slowly intensifying, despite the lack of attention it has received. Foreign investment in Russia is notably continuing to decline. President Vladimir Putin of Russia, considers the collapse of the Soviet Union as the biggest geopolitical disaster of the late 20th century. He has staked his reputation and presidency on changing the outcome of this calamity. In his mind, Russia has been mostly on the defensive since the end of the Cold War. His objective is to reverse the loss of power and prestige, that Russia once enjoyed inside the the former superpower of the Soviet Union. This is why Putin decided to abrogate the Budapest Memorandum, signed in 1994. The treaty guaranteed the borders and independence of the Ukraine, in exchange for the nuclear weapons that were left in their territory, after the collapse of the Soviet Union at the end of 1991. The signatories of this accord included Russia, the United Kingdom, and the United States. It is no wonder that the Ukrainians feel betrayed and no longer have any confidence in Western assurances and especially pledges coming from Russia. Putin has studied history and wishes to follow the playbook initiated by the German leader Adolf Hitler in the late 1930’s. That is he will use the stated goal of protecting Russian minorities as a pretext for intervention, in countries that border his own. The incursions in Georgia and Ukraine by the armed forces of Russia are just the beginning. Putin intends to use the same tactic in one country after another. His next target may well be the Baltic republics of Estonia, Latvia and Lithuania. 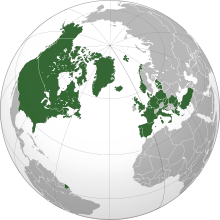 The breakup of NATO (North Atlantic Treaty Organization) must come about, for Russia to regain Great Power status in Europe once again. The 28 country Western military alliance, essentially surrounds Russia geographically to the west and southwest. It is a dangerous game that Putin is playing. Unlike his previous adventures, the move against the three Baltic nations could bring about a much more serious confrontation with the West. This is because these small nations are in NATO and Article 5 of the original treaty states that an attack on one country in the group, is an attack on all of them. This would include the United States itself. The strategy that Russia will follow in the Baltics has already worked rather well elsewhere. The best example of this was seen by the events that took place in Crimea, at the beginning of 2014. Men arrived in uniforms, that do not identify their country of origin. These small squadrons quickly gain control of the political and economic levers of power, by seizing vital infrastructure including communications and transportation. 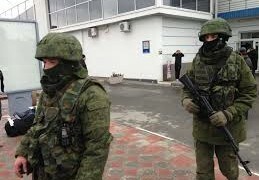 These little green men are very effective in a country unprepared and ill equipped to deal with such an attack. The Russian scheme will be especially effective in countries that possess a large Russian minority that can be expected to either cooperate or at least sympathize with the arrival of these troops. This is why the Baltics are particularly susceptible to this kind of invasion. As former republics of the Soviet Union they all contain sizable populations of Russians. In addition, the total population of all three countries is only 6.27 million in an area of only 67,574 square miles (107.826 km2). In Estonia, ethnic Russians make up 24% of the population with even more minority groups speaking Russian as their mother tongue. These people consist mostly of Belorussians, Jews and Ukrainians. In a real national emergency it is not clear where their true loyalties will lie. In the capital of Tallinn,over 46% of the inhabitants speak Russian as their first language. However, it is foolish for Russia to assume that these various groups would automatically support the subjugation of Estonia. These individuals on the whole, are economically better off in an independent western orientated country, rather than as a province or political satellite of Russia. 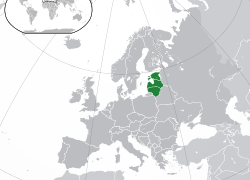 In the republic of Latvia, 27.6% of the total population is ethnic Russian. They make up about half of the inhabitants of the capital Riga, and actually form the majority in the second largest city known as Daugavpils. In Lithuania, the Russian minority is only about 4.9% and is mostly concentrated in the cities. The situation in eastern Ukraine may seem to be frozen for the moment, but appearances can be deceiving. Russia has now become somewhat dissatisfied with the arrangement reached in the Minsk II accord. 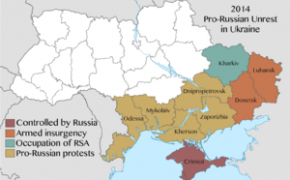 Using the occupied territory in the east as a wedge to further destabilize and weaken Ukraine, was seen as a worthwhile Russian objective in March of this year. The goal was to have leverage in forcing Ukraine to abandon the new western orientation of the government, in return for a new settlement in the east. 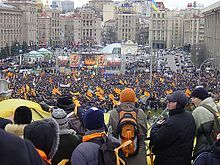 The outcome was based on the Russian theory that the new Ukrainian government would want to negotiate for the return of the separatist territory in the east. That has not happened. Instead, Ukraine has cut ties to the Donbass region and installed an economic blockade. A new virtual border has come into existence, delineating the areas controlled by the separatists and the forces of Ukraine. It has left a section of Ukraine dependent on Russia not only for military assistance, but economic aid as well. Both sides assumed time was on their time, while they each built up their military capabilities for the next phase in the war. Russia was hoping that the Ukrainians could be pressured to lift the blockade and permit the reintegration of the region. In exchange for this territory, Ukraine would be expected to decentralize their government and drift back into the Russian political orbit. The problem with the plan set forth by Putin, is that it is in total opposition to what the majority of the Ukrainian people aspire to. Voters there have already rejected the previous pro Russian government and have instead installed a government that promises much stronger ties with the rest of Europe. The Ukrainians do not wish to be a political and economic satellite of a revanchist Russia. 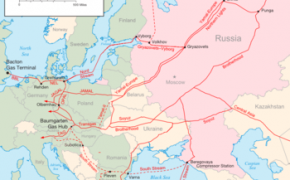 The Ukrainians like other parts of Europe, purchases natural gas from Russia on multiple year contracts. Russia at present provides the European Union with 25% of its annual consumption of natural gas. Approximately 80% of this energy is transported by pipelines with a number of these lines going through Ukraine. Of course, Russia insists that they will no longer ship natural gas through Ukraine after 2018. Separatist attacks are increasing in the eastern regions of Ukraine. Russia of course is blaming the authorities in Kiev, for the breakdown in the ceasefire. It is true that Ukraine is making no effort to bring about the political solution agreed to in the Minsk II agreements. The government of President Poroshenko of Ukraine clearly recognizes that reincorporating the regions of Donetsk and Luhansk would not be simple and the cost for reconstruction of these war devastated areas would be prohibitively expensive. Ukraine is in the process of attempting to restructure $19 billion USD (United States Dollar) of previous loan guarantees. The country will continue to need assistance from European partners and the IMF (International Monetary Fund) for years to come, if it is able to maintain independence. The country received $17.5 billion USD from the IMF last year alone. Ukrainian voters would like a conclusion to the fighting in the east, but place a higher priority in improved living standards for the rest of the country. The economy of Ukraine has been in a tailspin for 18 months. Capital controls and a lull in major fighting in the east, has allowed some stability in the the nations currency. The hryvnia had been in a free fall, before the government finally intervened. It has recovered 12% of value in the second quarter against the American dollar, but is still down 28% from a year ago. The GDP (Gross Domestic Product) of Ukraine has sunk 14.7% from a year ago. Total economic contraction this year is expected to be 12%, but a turnaround in the economy would be possible if war is not reignited. The nominal GDP of Ukraine is $85.4 billion USD with a PPP (Purchasing Power Parity) of $353.1 billion USD. Unlike the Baltics, the Ukraine has a large population of some 42.910 million and a land area of 233,013 square miles or 603,500 km2. They will not be easily absorbed by Russia, if it comes to a full scale war. For Russia time is running out. The slowing economy in China and the increasing crude production in Iran forebodes a further reduction in global oil prices. Russia has become increasingly dependent on the sale of oil and natural gas. Oil is Russia’s main export earner (68%) and a big contributor to the national budget. Between 40% to 50% of the income for the government is attributed to taxes levied on oil. Russia needs crude to sell at $100 USD a barrel, in order to balance government finances. Each time the price of oil drops $1 USD, it costs the Russian economy at least $2 billion in revenues. The Russian economy for the first time since 2009 is back in recession. The economy is expected to contract at least 3% in 2015. The $360 billion USD in cash reserves will ease the immediate crisis, but conditions in Russia are likely to get worse, especially for the consumer. Declining energy prices combined with tightening Western sanctions will make the foreign adventures far more expensive for the Russian economy. The status quo in Ukraine has been a constant drain on Russian finances with the constant danger of a military reversal. Recognition of the separatist states in the eastern part of Ukraine seems elusive, unlike the moderate permanence achieved with Abkhazia and South Ossetia in the 2008 war against Georgia. Leaders of Belarus, Russia, Germany, France, and Ukraine at Minsk II summit, 2015. Unlike Georgia, Ukrainian forces could still possibly overwhelm the separatists and recapture territory, especially if Western support is stepped up. Russia is aware of the changing politics in Europe and especially the United States. A new American administration will be installed in 2017 and it will likely be more assertive in dealing with Russian aggression. A likely Republican victory there, is apt to lead to arms transfers to Ukraine that could easily tip the military balance against the separatists and the 12,000 Russian troops stationed there at present. At that point, Putin would either have to accept a new agreement or escalate the conflict even further in a proxy war between Russia and the United States. So it would be to the advantage of Russia to crush the Ukrainian army decisively while the feckless and inexpedient Obama Administration is in control of American foreign policy. The President of the United States has refused to arm the Ukrainians in the concern that it will escalate hostilities in the region. His present sentiment is to somehow force the Ukrainian government and the Russian government to negotiate for a peaceful resolution to the conflict. President Obama has refused to publicly state what is obvious. Ukraine has been subject to an invasion by the Russian army. Without the direct introduction of Russian troops in 2014, Ukrainian forces would of overrun the separatist positions and the conflict would have been resolved by now. A newly reinforced Ukrainian army would most likely be tempted to arrive at a solution in the eastern portion of the country, by military means once again. It would raise the stakes on both sides. A new American President may be far less fearful of this possibility and might actually encourage it, as a way to blunt further Russian aggression in Europe. There is the additional difficulty of the breakaway region of Trans-Dniester also known as Transnistria. 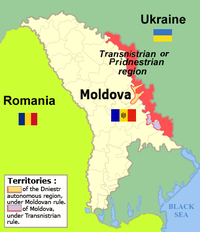 The area declared independence from the former Soviet republic of Moldova in 1990. Paramilitary forces captured the government institutions of the area, the following year. The insurgency continued culminating in a major battle, in June of 1992. The following month a ceasefire was declared and the settlement is being enforced by the Russian 14th army, already stationed there. It has remained in place since that time. 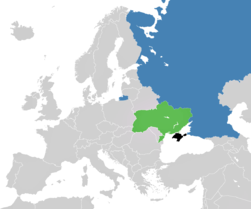 Russian loyalists dominate the political landscape of Trans-Dniester, geographically situated between Moldova to the west and the Ukraine to the east. Leaders from the state asked in March of this year, to be incorporated into Russia itself, following the earlier annexation of Crimea in 2014. The Ukrainian government has raised the stakes further, by denying access to the region through their territory for military supplies and reinforcements, of the 1,500 Russian troops in the breakaway territory. If Moldova denies total accession as well, a new military crisis will soon unfold in the region. Russia could with the assistance of the separatists in eastern Ukraine, make a dash to retake Mariupol to the south. The capture of this port city on the Black Sea would provide a land bridge to Crimea and a beach head to further penetration of the coastal area, in an attempt to reach Trans-Dniester overland. Of course this would lead to a full scale war, in which the rest of Europe and the United States may well feel compelled to provide further aid to Ukraine. 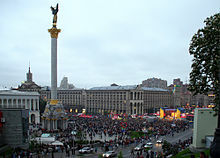 Euromaidan. State flag of Ukraine carried by a protester to the heart of developing clashes in Kiev. Events of 18 February 2014. Before the overthrown of the Pro-Russian government. The international condemnation of Russia and the resulting economic effects by a rapidly expanding sanctions regime, would be costly to the Putin regime. The economy of Russia would be hard pressed to sustain a protracted war, in a country the size of the Ukraine. In addition, as Russian forces moved west and south there will be an absence of a Russian minority. 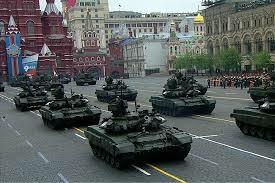 Resistance would therefore stiffen and the Russians might well confront more advanced weaponry, hurriedly supplied by the West to prevent a collapse of the Ukrainian army. The repercussions of an all out war would be felt in the former Soviet republics of Central Asia as well. 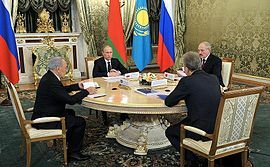 The nations of Kazakhstan, Kyrgyzstan, Tajikistan, Turkmenistan, and Uzbekistan for a total population of 66 million, would logically reassess their present mostly friendly relationships with Russia. 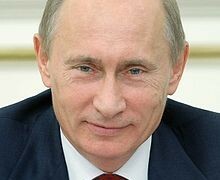 Further cooperation and integration of their domestic economies with Russia would be endangered. The Eurasian Economic Union (EAEU) would be left in tatters and further expansion of the economic pact unlikely. It would be questionable if the present membership of Armenia, Belarus, Kazakhstan, Kyrgyzstan, along with Russia would be able to expand any further, under conditions where Russia invades nations on its periphery. Putin will no doubt weigh his options carefully, taking advantage of any further signs of weakness by the West, particularly the United States. He is well aware of the political change occurring in the United States, as Americans grown increasingly dissatisfied with the inept and ill advised foreign policy of the present administration. Increasingly provocative military exercises by Russia across Europe and near the borders of member nations of NATO, has only intensified feelings of anxiety that exist there. In some cases like in Eastern Europe, it is only stiffening the resolve of the citizenry. This is obviously having the opposite effect that Putin wishes to instill. The present state of affairs will only grow more tense for the rest of 2015 and 2016.